...And HAPPY NEW YEAR..! Where the hell does the time go!? A quick review of last year's projects and an overview of the production schedule ahead for the brand new year. 2009 - A Rather Transitional Year! Three animated shorts were produced to promote the business in 2009, using Adobe Flash (with Adobe Illustrator/Photoshop to originate artwork) and Stop Motion Pro with Adobe Premier. Audacity was used to edit sound for all projects, and is a highly recommended freeware tool for audio editing. The main lessons learnt with regard to the 2D shorts were the limitations of Adobe Flash for outputting to video, in particular syncing sound. The reasons are complex, but the solution to an accurate sound and vision mix when exporting Flash movies to video is to add the sound separately, in a video editing software package such as Adobe Premier or Final Cut Pro. The most fun had was producing the Christmas claymation. 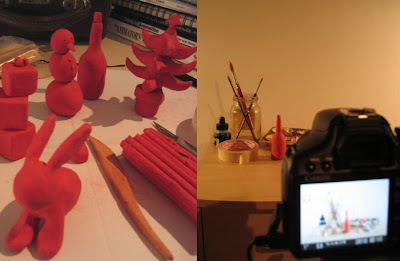 It began as a test of the new studio set-up and camera (Canon EOS 450D) and resulted in a 17 second claymated short, 'It's Beginning To Look A Lot Like Christmas', a Morph-esque clay model production. Learnt a *huge* amount from this production and the process has also highlighted issues that need to be solved in the studio with regards to rigs, sets and lighting in particular. Opted for the minimal reconstruction (i.e. damage) to the room - and having used the space to produce the Christmas claymation, I think the general approach taken was the right one. The room has been divided into a production area and an office with a 6ft(+) room divider. Photographic darkroom blackout has been erected over both windows so lighting can be controlled at all times. The lament floor has a slight bounce, which can be seen in the claymation short, but a heavier table, tripod and sandbags, etc. should eliminate these issues in future productions. Pleased with the camera and software co-operation. Stop Motion Pro has so far proved a stable and useful frame-grabber and the Canon EOS interface similarly coherent and reliable. So, next year's immediate challenges will be lenses (Nikon with Canon adaptor) and lighting, along with deepening my overall understanding of photographic/cinematic principles. 2010 ... Year Of The MiLK HaRE! The main project for 2010 will be 'Milkhare'. I've had great fun via various MiLK HaRE social networking sites on Facebook and Twitter (coming soon to Vimeo) meeting creative people and sharing influences and media around the theme of "The Gothic, The Macabre And The Downright Odd", with particular emphasis on animated productions. Hope to continue this into the new year and also start to share production materials from the 'Milkhare' project across these channels, so creative processes are apparent and progress is incrementally noted. A great deal of underlying pre-production is now complete, including a story outline and thumbnail storyboards. As the production will use actual locations in addition to animated objects and models, location scouting is high on the list of production priorities in the first few weeks of the new year, as is model design and production. In terms of time-scales, the aim is to complete the project by August/September 2010 and start production by Feb 2010, leaving the last 4 weeks for post-production. Regular updates will be provided to MiLK HaRE network subscribers and also on this blog. In addition, I aim to continue to produce White Rabbit shorts in various animated formats to test ideas and techniques. I hope you had a wonderful Christmas and wish you a lucky new year!